On their previous full-length album V: Hävitetty (Finnish for V: Ravaged), the masters of imposing Finnish folk brutality Moonsorrow gave us a sonic equivalent to the apocalyptic firestorms and assorted eerie foibles that one would imagine would arrive with the end of the world. This album was also impressive for the fact that it contained only two songs, both clocking in at around 30 minutes. Varjoina Kuljemme Kuolleiden Maassa (As Shadows We Walk In The Land Of The Dead) is their sixth studio album and is a bit of a thematic continuation to its predecessor. A fully fledged concept album, we now receive the aftermath: the stories and soundscapes the random few unfortunate enough to be alive find in the grey, desolate wasteland that remains. The songs are almost radio-lenght compared to the cinematic duration of the songs on V: Hävitetty – meaning of course Moonsorrow-radio. Thus we have four tunes clocking in between 10 and 16 minutes each divided by three minute-and-a-half interludes that mostly contain the howling wind, desperate breathing and the sluggish footsteps of the story’s lonely travellers. 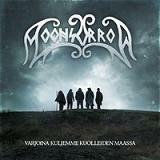 The four aforementioned tunes carry on the epic tradition of Moonsorrow with plenty of gargantuan guitar riffs and drum rolls to create a very impressive wall of sound. Keyboards are constantly present to bring the melodic niceties while instruments like mandolin, bouzouki, mouth harp and even saw (yes, the tree-cutting kind) are used for delightful flavours. Out of the songs, the 15-minute Huuto (The Scream) stands out as the big hit with a superbly infectious melodic theme repeated throughout, from the subtle acoustic intro to the steamrolling verses. Bass player and primary vocalist Ville Sorvali’s hoarse ranting and occasional tortured screams fit the atmosphere perfectly as the tunes emanate the ever-dwindling hope of people facing the kinds of landscapes depicted in these tunes. The band’s signature chanting choirs are represented in fine form, even if one of the few things I might whine about on this record is that I would’ve wanted more choirs. Then again, I’m a sucker for pomp and the more subtle approach suits the overall direction. Even if that is one of the few things on this record that could be called “subtle” in general. Yes, oh so epic throughout right down to the massive production job. The biggest difference between this record and Moonsorrow’s earlier material is probably the overall tempo, as you don’t get that many blast beats or really fast moments here. While the moshpits may be disappointed by that, the theme of this album warrants a more “meditative”, doomy heaviness. And oh how beautifully doomy it is. Varjoina Kuljemme Kuolleiden Maassa is not the kind of album you’d probably take to the beach or to a party (or if you would, I want in on that party) for a leisurely good time but if you’re looking for an album that brings a gripping story wrapped in the kind of music that should leave you feeling like numerous legions of vikings just trampled you underfoot, then you buy this sucker now.